Shona and new girl Meili model two more Debonair Designs, as interpreted by Kit’s Couture. 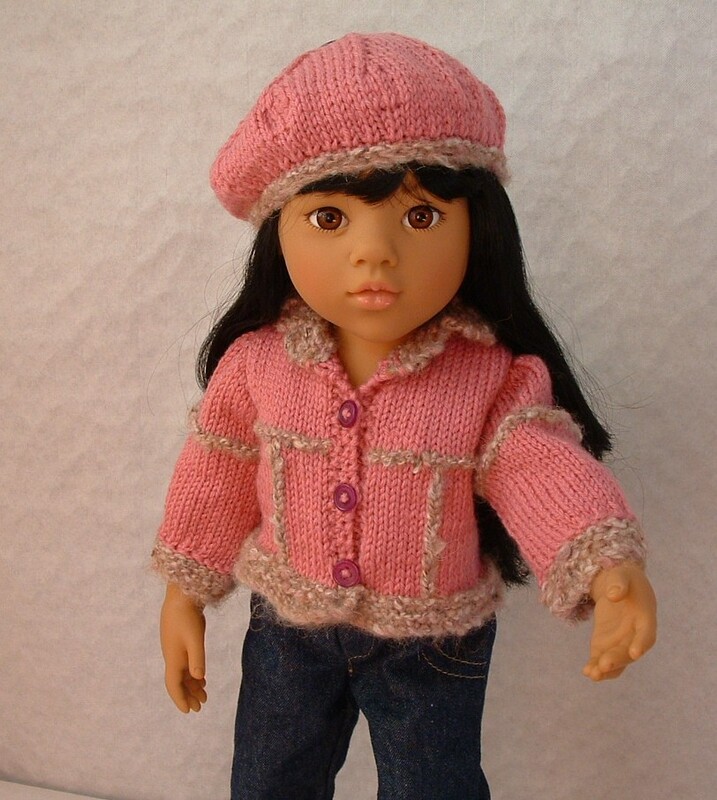 Originally I intended the Sinclair Jacket for Shona, as the pink Jarol yarn was best suited to her cool Winter colouring. But for reasons I shall explain below, Meili ended up with the jacket, and Shona got to peacock about in a striking cabled cape instead. Both patterns are available on Ravelry (and Craftsy too? 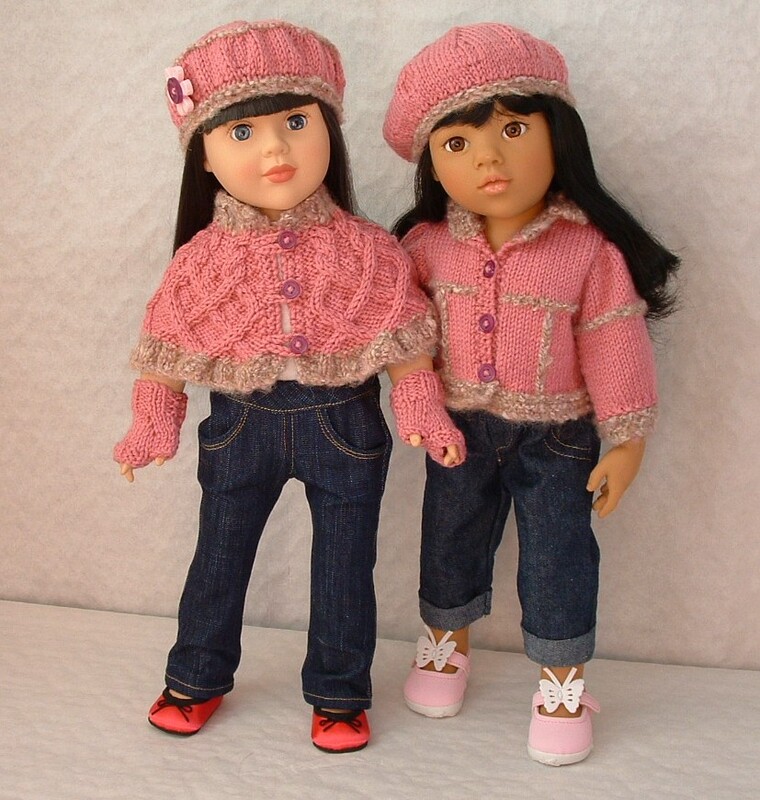 ), and both are in Deb Denair’s book Seasonal hand knitted designs for 18″ dolls. The patterns are designed for worsted wools available in the USA, but Deb helpfully tells us that this is equivalent to UK double knitting. She also gives UK needle sizes as well as the US ones. I used shade 109 ‘Pink’ from Jarol Heritage, a wool-rich DK yarn which comes in a good range of rich colours, and for the textured yarn I used Sirdar Freya ‘soft & brushed Winter cotton’, in shade 853 ‘Dusk’. I’d used the Jarol Heritage double knitting with great success with Deb’s gansey patterns, so I was pretty confident with that. The Sirdar Freya was an unknown quantity, but it seemed to knit to about the right tension so I bought a ball and hoped! This unusual jacket, we’re told, was inspired by the popular Sherpa jackets… I have to admit I’d not heard of Sherpa jackets so I was none the wiser. But to me this looks like a knitted version of the kind of sheepskin jacket which is made up of pieces of sheepskin stitched together. The textured yarn seems to me to be imitating the fleecy side of the sheepskin, and the single rows of texture are the joins. The pattern calls for UK needles sizes 10 and 9. I checked the tension with the size 10s and it seemed fine, so I made a start. I found this a fairly challenging pattern, in spite of the fact that it’s just in plain stocking stitch. The textured yarn additions meant that I was having to change yarn fairly regularly, and the collar revere sections were a little tricky. Plus I soon began to have doubts about the sizing. I was constantly trying the pieces against Shona and wondering if they were big enough. Shona is a little slimmer than American Girl and Gotz Precious Day, so I told myself it must be fine, and carried on until all the parts were complete and I was at the making up stage. As I sewed up the jacket my worries about sizing grew. As soon as I could try it on Shona (without sleeves), it was clear that it was too small for her. The neckline in particular was very tight. For a brief moment I wondered about unpicking everything and starting again, but then I realised that what wouldn’t fit the sturdy sized 18″ doll would certainly fit the slim type. So I turned to one of my newer models, Meili, my Gotz Hannah. 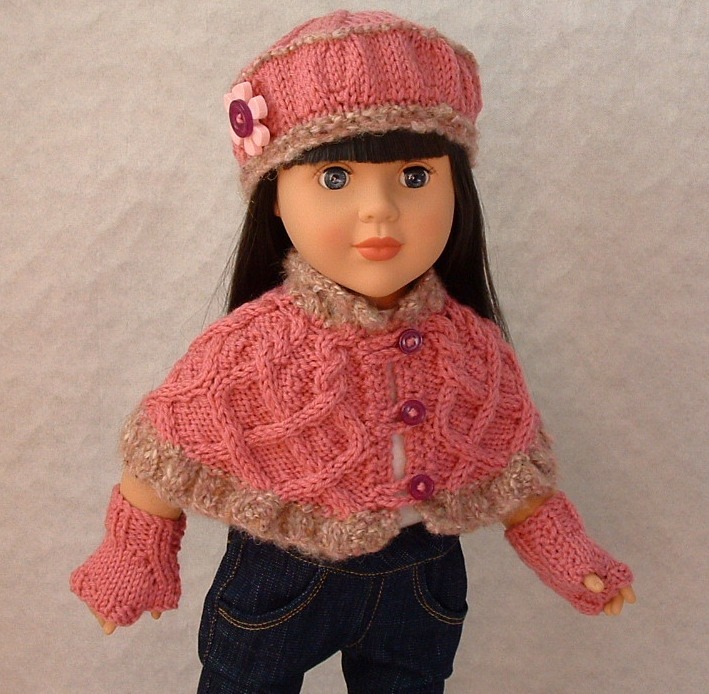 She is a tall 19″ girl whose arms and legs are similar in size to the sturdy 18″ dolls like American Girl and Favorite Friends. But her body is slim, closer to the Kidz ‘n’ Cats in size. I tried the jacket on her, and it fit perfectly. The sleeves were barely long enough – she has long arms – but not disastrously so. 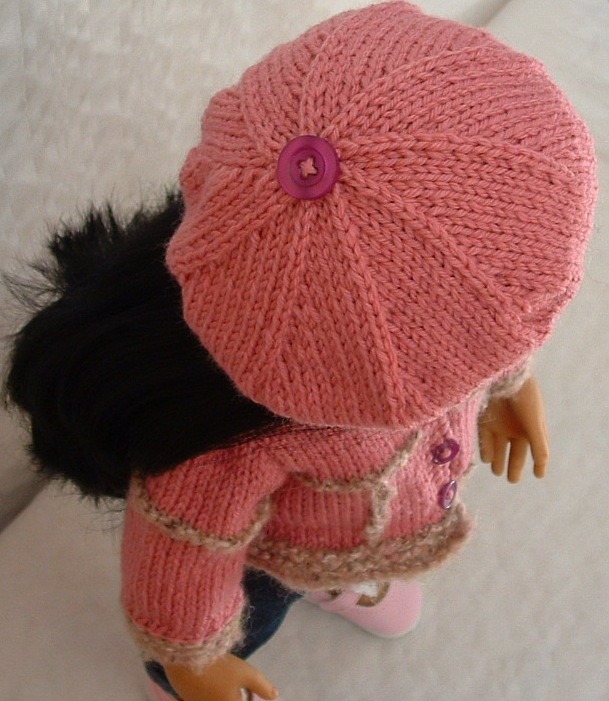 The colour wasn’t ideal for her, as it was a Winter pink, but the textured yarn had a brownish tint making it similar to Rosewood, the Autumn pink. So I decided in the circumstances that I needed a model for the garment and we could get away with it. Then I turned my attention to the hat. The Sinclair hat is styled to look like a newsboy’s cap with a peak, and looks great with the jacket. I knit up the pattern as given, tried it on Meili’s head, and found that it was a bit tight. I thought about this carefully, did a bit of optimistic stretching of the band, and tried it again. OK, it would just about fit, but without the relaxed slouchy look of Deb’s examples in her book. At that point I decided to abandon the newsboy cap attempt and turn the hat into a beret. I had another button to match, so I sewed that on top and it finished off the beret very nicely. Meili wears it pulled to one side in the authentically French manner! 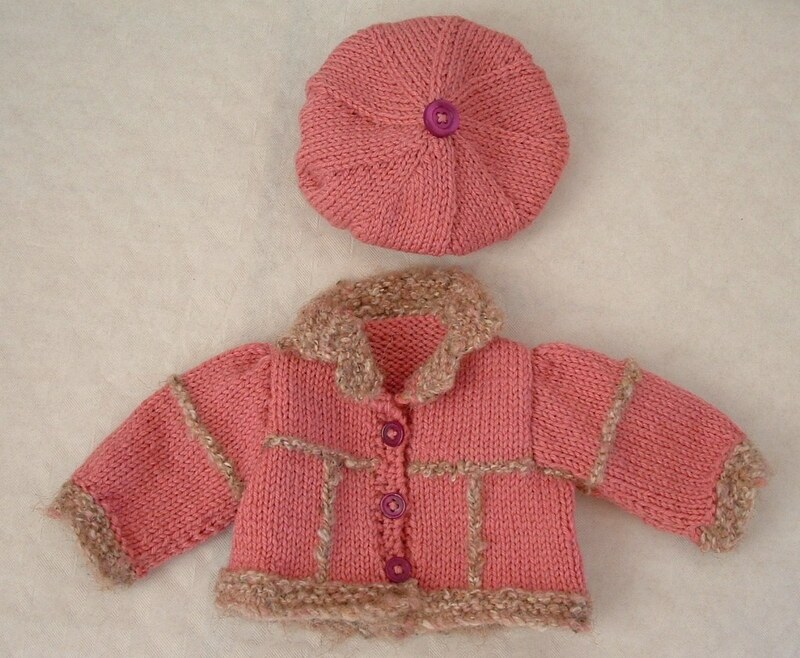 I still had plenty of the pink wool left, but probably not enough to make another full jacket for Shona. So I searched the book for something perhaps less demanding of yarn, and found myself contemplating the Pemberton Capelet. After my experience with the Sinclair jacket, I was doubly careful about tension and dutifully worked a full square in stocking stitch. The pattern called for 6 stitches and 8 rows with size 9 needles over the lattice cable stitch, but how could I cable a tension square? I had six stitches and 8 rows to an inch over stocking stitch. It had to be fine, didn’t it? Of course it did. Ahem. It had been a long time since I’d done any cabling, but Deb’s pattern was as usual crystal-clear and with my trusty row counter to help me I had no problems at all. I’d made life easier for myself by not using the textured yarn for the button bands, just for the ribbing at the hem and the collar. I was glad of this as having to cope with changing wool at each end of every row, as well as doing the cabling, would have been a step too far! It all went quite smoothly and gradually a the cape took shape. When it was finished I tried it on Shona – and it did fit. Just. I have to say I’d have liked it to be a tiny bit more roomy – there’s hint of gape where the front edges join – and a little longer wouldn’t have hurt either. But it still looks great. 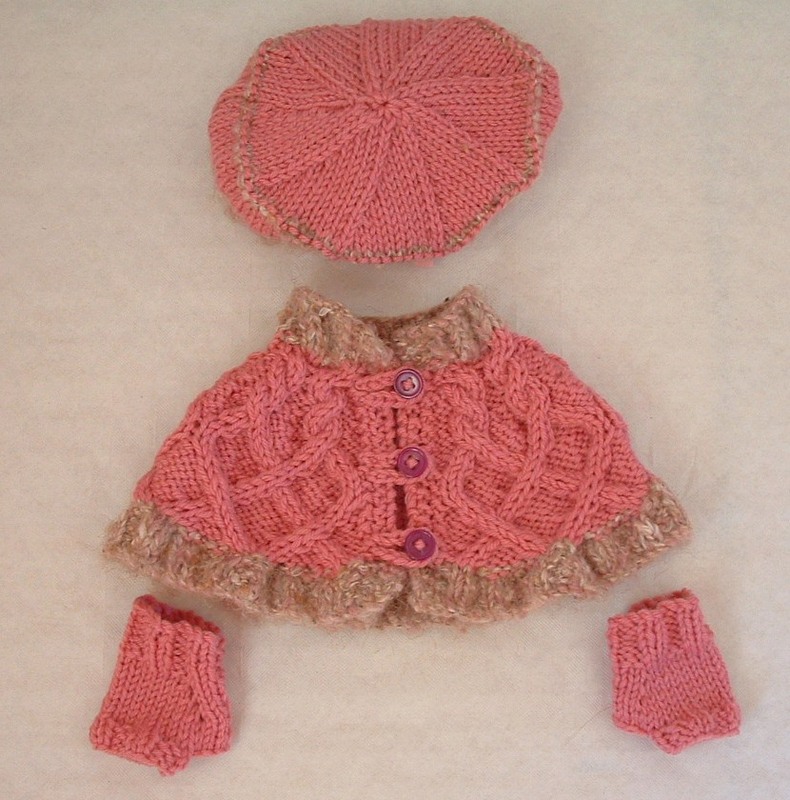 Three contrasting mauve buttons and three crocheted loops later, and it had style. 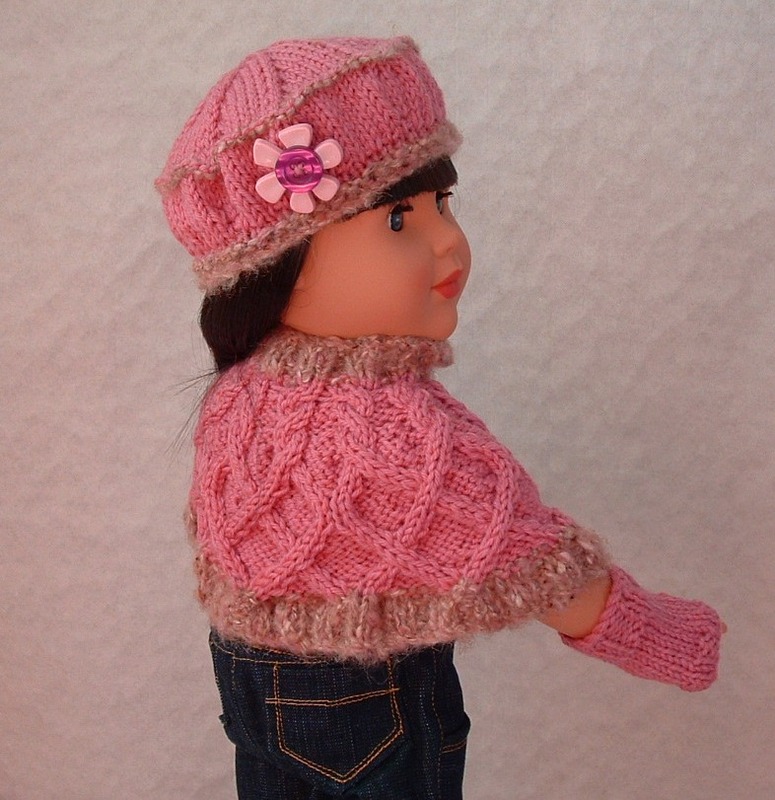 Now – did I have enough yarn left to make the hat? It was worth a try. The Tam comes in several variants: I chose the one with the ridge, which I thought gave it more structure. I followed the pattern carefully, using the smaller size needles (10) for the band and changing to the large needles (9) with the main colour. After I’d done the main body of the hat up to the ridge, I stopped, puzzled. This was a tall hat! In fact, it was far too tall. And trying it around Shona’s head, it was also too tight. Bother. So I went back to the pattern, did a few calculations, and enlarged it by 8 stitches to make it fit around Shona’s head. This meant that I had to adjust the 5th row – the increase row – to ensure that I still ended up with 90 stitches. I did two increases over every three stitches, and all was well. I also reduced the height of the hat by 6 rows, and once the crown was finished I found that this time it fit very well indeed. It just needed a pink flower button topped with another mauve button to finish it off. And I still had some yarn left! Time for the fingerless mitts. These took no time at all, and very little yarn. In fact I extended the ribbing section by a couple of rows to make them a little longer. No problems with sizing here, they fit perfectly and are the perfect accessories for this slightly Victorian retro ensemble. So why did I have such problems with tension? Thinking about it, I think with the Sinclair jacket I should have gone up at least one needle size – possibly even two – and taken more care to get the tension exactly right. These little garments don’t have a lot of margin for error and one or two stitches either way do mean the difference between a good fit or too tight a fit. But the real puzzle is the hat. I can understand the band being too tight, just like the newsboy cap, and I put that down to the Freya yarn not being a good match for the textured yarn originally used in the pattern. But how was it that the hat was so much too tall when on every other occasion the Jarol yarn knit up to size or even slightly too small? It’s a mystery.